Ristenpart's recordings for Club Français du Disque appeared in the United States most frequently when they were licensed for domestic release by Nonesuch. This CDR release does not identify the source of the recordings contained therein, but I know that at least the Vivaldi double concerto appeared on Nonesuch in the 1960s. (Today, Nonesuch has shockingly little interest in their back catalogue and prefers to focus on contemporary repertoire and performers.) It would have been helpful if ReDiscovery had identified these concertos by more than just their keys, but perhaps the LPs omitted this information as well. 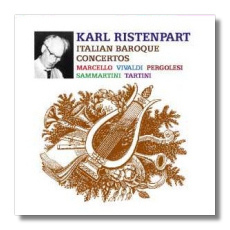 Ristenpart was young enough to catch wind of the "original instruments" movement, but in the 1960s it was more a curiosity than an expectation, unlike today. (The worm is turning, however.) The Chamber Orchestra of the Saar happily played modern instruments, and did so in a predominantly modern style, although it would be wrong to condemn these readings as stylistically uninformed. Nevertheless, there will be those who will object to their latent romanticism, and they need look no further than the famous middle movement of Marcello's Oboe Concerto for ammunition. As for myself, I think it's gorgeous. Rampal needs no introduction, and Pierlot is only a bit less familiar. They were consummate musicians and masters of their instruments, and the listener is in very good hands with these gentlemen. Probst and Lemmen are not as famous, but they make a very agreeable impression in their concerto too. ReDiscovery's David Gideon seems to have used very well cared-for LPs as the source material. The results are warm, quiet, and clear – fully the equal of almost any CD on the market today. Of course that doesn't compensate for oddities in the original recordings. Soloists are balanced too far forward. In the first Vivaldi concerto, the soft-spoken guitar has no trouble competing with the orchestra! ReDiscovery releases are available over the Internet at www.rediscovery.us; their service is fast and courteous. The asking price for this CDR release is only $15, and that includes shipping and handling. The releases look endearingly homemade – no labels on the CDRs apart from a handwritten catalogue number near the spindle hole, and rudimentary (yet effective!) cover art and release notes – but the digital remasterings are superb, and Ristenpart and Co. leave the listener with the same species of contentment associated with a good meal.